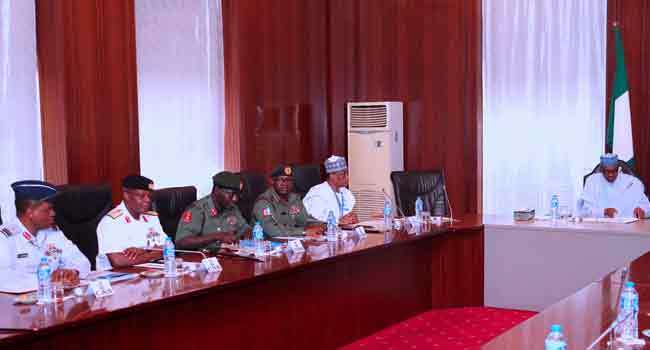 President Muhammadu Buhari is currently holding a closed-door meeting with the Service Chiefs at the Presidential Villa in Abuja, the nation’s capital. The President is expected to appraisal the security situation in the country. In attendance at the meeting are the National Security Adviser, Mohammed Babagana Monguno, Minister of Defense, Mansur Dan-Ali, Director General of the NIA, Ahmed Abubakar and Inspector General of Police, Ibrahim Idris. This follows an earlier meeting on Monday where President Muhammadu Buhari and Vice President Yemi Osinbajo held separate meetings with the security chiefs. The president first met with the security chiefs and heads of security agencies after which the Vice President held a meeting with the Inspector General of Police (IGP), Mr. Ibrahim Idris, the Director-General of the Department of State Security, Lawal Daura; and the Attorney-General of the Federation, Abubakar Malami. Although the IGP refused to disclose details of the meeting which lasted for over two hours to journalists, it is believed to be in connection with the ongoing case involving Senate President Bukola Saraki and the police.